How bees and honey have become part of Edmonton’s DNA. Dustin Bajer stands right outside his back door while bees lazily fly past his head into his yard. He moves a little to the side, admiring the plants unfurling beyond what would be typical garden boundaries. The rows are spread across the entire yard; there are straight lines of beans on one end and potatoes popping up on another. Between Bajer’s yard and his neighbour’s, a vine interweaves between horizontal wires, creating a living fence. Bees hum their approval as they twirl from one flower to the next before heading back to the hive, custom-built by Bajer, that recreates their natural habitat in a tree. Meanwhile, the neighbours also have a hive, which Bajer has looked after ever since the city passed a bylaw in 2015 that says residents can have one hive (and a nook, or smaller, baby hive) on their property, provided they meet a series of requirements. It’s not new for Albertans to keep bees – in fact, the province has so many professional beekeepers that it is the largest producer of honey in Canada and one of the major producers internationally. For decades, large-scale beekeepers have harvested the sweet stuff outside of the city, and now even urban residents can benefit from having bees around. But honey isn’t the only benefit, and the purpose of legalization goes beyond its production. Instead, says Keith Scott, a City of Edmonton coordinator in charge of regulating beekeeping, the City hopes to see people embracing nature in their backyards and public spaces. More pollination increases the ability for food production in gardens, yards and public spaces, while building communities of people who are connected with each other and the natural world. Bajer’s a teacher currently pursuing a variety of ecological projects while on a leave of absence, including the tending of 16 hives across the city. Among those hives are some at the Valley Zoo as well as eight at Northlands, where he runs classes for young beekeepers. Beehives are now even found in the gardens of hotels, restaurants and other commercial spaces with the Hotel Macdonald, Mosaic, Shaw Conference Centre, Northlands and the Matrix all enjoying the honey of their labours. Legalization happened because NAIT Biology instructor Jocelyn Crocker was looking for a way to increase the fruit in her backyard – the first summer she and her husband, Mike Hamilton, planted a food forest, it produced little more than a handful of flowers. Keeping bees was a natural solution; but when Crocker took a course in 2014, she found out the practise was illegal. She and another classmate, Chris Floden, saw there was a bee pilot plan already in the city’s FRESH strategy, which aims to improve the local economy along with social and environmental systems through food and agriculture. They decided to push to make it legal and not only were they successful in getting both a pilot and legalization, they also created a community of people interested in beekeeping through YEG Bees, an informal group that now conducts community outreach, hosts lectures and sells honey samples. In some cities, beekeeping has never been officially addressed in the books, leaving room for many potential problems – such as people having too many bees, not knowing proper husbandry practices, or respecting a neighbour with a severe allergy. “The way it’s happened in Edmonton, it hasn’t been a fad, it’s grown slowly,” says Hamilton. The City’s bee community is even going so far as to have systems in place that are ready to deal with things that may arise as bees become more popular. Case in point; swarming, a natural behaviour that happens when the bees run out of room in the hive. There is a list of about 45 beekeepers, who are prepared to help, including Bajer. Last year, he caught 40 swarms, though he says most were from wild bees. 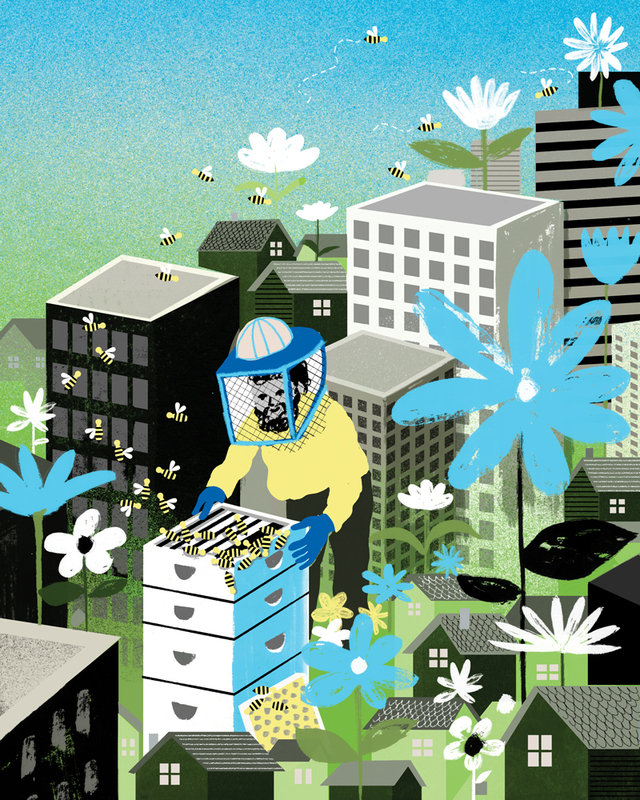 But, in the coming years, as more people keep bees, urban swarms could also be more common. Swarming is something people can prevent, but, in some cases, it’s not as easy. The John Janzen Nature Centre, for example, has a hive that tends to swarm every year due to its fixed size that can’t be managed for growth. Last year, when Bajer got the call about the swarm, the bees were buzzing in a tree, far beyond the reach of any ladder. “Luckily, right across the road, there was a tree service so they had a big cherry picker. So we walked over, and asked them if they could lift me up, and get the swarm,” says Bajer. While wearing a veil, he climbed into the cage of the machine. He was lifted to the appropriate height, where he shook the tree branches, and the bees fell into a large Tupperware container that he quickly covered with a lid. He then brought the bees back to the centre. Bajer predicts that, over the next few years, urban beekeepers will also start selling bees among each other as a way of managing hives, preventing swarms and making money. Honey bees are not native to Canada, but, if beekeepers start selling them locally, Bajer believes over time they may adapt to the specific conditions of our city. “So, they’d likely be more attuned to the weather, and to the particular diseases and pests we get here,” he says. “We believe the bees can help grow Edmonton’s reputation as a leader in sustainability,” says Shaw Conference Centre Manager of Marketing and Communications Imran Gill. The Shaw has one hive in its southeast corner under Hall B, which is part of its move to become more sustainable alongside the building’s sustainable design, a living wall, permaculture landscaping and a comprehensive waste-management program. It already has Boma Certification, and has Green Key Level 5 status, which is the highest level of sustainability available through the international certification body. Beekeeper Patty Milligan, who tends the Shaw Conference Centre hive, says the honey has a minty undertone, which is likely due to an abundance of cat mint in the surrounding gardens. In the summer, up to 100,000 busy bees produce honey that the Shaw uses in its kitchen, while Milligan shows off the hive during special events. She’s seen the difference it makes for people to get up close to a creature they would normally avoid out of fear. “Maybe one person stops when I’m working on the hive, but they’ll go and talk to their family at the supper table. It has a strong resonance,” she says. Last year, that ripple effect was felt on the other side of the world when a Japanese production team came to the Shaw and filmed Milligan tending the bees for a series of international educational tips called Bee World. She also tends four hives at Northlands, and Bajer looks after the remaining eight. In the summer, Bajer taught beekeeping classes at Northlands for 20 youth aged 11-18, who donned the veils and suits and checked on hives themselves. Opportunities like this one, says Bajer, are helping create a whole new generation interested in their environment. “It’s not a rotisserie; you can’t just ‘set it and forget it.’ There is a time commitment. You want to be checking your hive every seven to 10 days.” Bayer says that, in terms of mentors, there are many great beekeeping organizations – including The Royal Alberta Urban Beekeeping Collective on Facebook as well as Edmonton Urban Beekeepers.